Brief Description: Life After Kes examines the history and legacy of the 1969 award-winning British film, Kes, about a boy’s (Billy Casper) relationship with a kestrel. This fascinating book not only pays homage to the vision and extraordinary talent involved both in front and behind the camera but also looks at subsequent changes in the educational system, posing some important questions. Are we any better off today? Have schools and teaching staff moved forward over the last few decades? Have successive government’s learnt anything from the mistakes of the past? Life After Kes explores the lives of the cast and production team since the making of the film including David (Dai) Bradley who played the lead role and examines why the legacy of Billy Casper and the national perception of Kes cast a shadow over South Yorkshire. Does Casper’s ghost still haunt this ex-mining community and is director Ken Loach’s gritty northern drama as relevant today as it was then? This book is a must-have for all film fans, anyone who enjoyed Kes and all those with an interest in British social history. About the Author: Simon W. Golding began his career writing for national magazines and radio including Radio 4’s News Hudlines and Week Ending. In 1995, he wrote Manquito establishing himself as a novelist and a move into non-fiction saw the publication of the revised edition of the best-seller Killing Time. The author subsequently signed as a screenwriter with Eighth Region Productions to write a trilogy of big budget scripts. Simon is currently co-producing the first TV comedy series he penned, For the Love of Ella, for Salopian Films, starring Ewen MacIntosh (big Keith in The Office), actress Lucy Drive and actor/presenter Alex Reid. He has also been writing a show with comedienne/actress/writer Helen Lederer, Helen Lederer asks… WTF? (Why The Fuss?) which opened in London to sell-out performances. In addition, Simon has appeared in The Culture Show, Saturday Night Live with Lenny Henry and The Time, The Place, presented by John Stapleton. His writing credits include BBC series The Culture Show and he also contributed to the 1997 documentary A Personal History of British Cinema by Stephen Frears. Simon is co-managing director at Salopian Films, director of productions at Plan B Media Productions, chairman and one of the presenters of The Valley Radio and director and organiser of the prestigious Bridgnorth Music and Arts Festival which raises money for various charities. Life After Kes is a wonderful anthology of one of the greatest British movies ever made. Kes is one of the most moving films ever. I cried during it. It deeply affected me with its humanity and revelation of life as it is really lived by many people in our country. The book pays homage to both cast and crew. I thoroughly enjoyed the book. Although the rude comments I made I don’t think I’ll ever work again! This book has brought back a lot of memories. It was intriguing to hear what the others had to say. Well done, an excellent book. I remember seeing Kes as a 13 year old student in my English class at a Secondary Modern school up North. My overriding memory of the film was its central character Billy Casper. I could see myself in him. A bit of a loner, an average student due to lack of interest on my part and certainly a lack of interest in me, shown by the teachers. I’m from a northern working class background, not the abstract poverty of Billy, but a struggle all the same. Even the landscape of the film was home, the pits replaced by cotton mills. It was the first time ever that I felt a film had reflected real life, and definitely something I could relate to. Thirty or so years later, the film holds different treasures for me. Now as well as its beautiful poignant story I can also appreciate it as a work of art. I feel pain and joy when viewing this movie. As I do all Ken Loach’s work. They are certainly not a comfortable watch. I could cry at the sight of Billy’s little face, the suffering, determination, sadness, aggression, boredom, hopelessness it holds, all before he has even said a word. As a mother of two sons I am deeply moved by Dai Bradley’s performance. In a nutshell this film has a heart that touches mine and that moves me to the tips of my northern roots. Life After Kes and all its stories has reinforced my love of the film. In this book Simon W. Golding has explored all that surrounds and is part of the Kes experience with a similar approach to that of its subject. It is not too earnest, it’s full of humour and essentially it is about people. Simon is obviously potty about the film and certainly potty enough to embark on two years of research to put this book together, but boy am I glad he did! 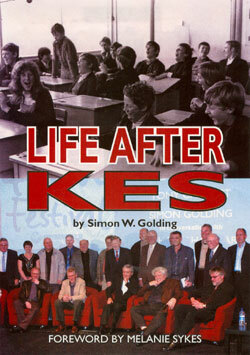 Life After Kes is a banquet of discovery, history, tales, anecdotes and insight into this landmark film. Kes fans everywhere enjoy the feast. Simon Golding, in his book Life After Kes, writes entertainingly about all the important scenes in Loach’s masterpiece Kes. It’s a fascinating read that is thoroughly researched, often funny, moving and certainly informative. It took the author 2 years of work to interview the cast and crew of Ken Loach’s iconic film Kes. Life After Kes is a wonderful read that lifts the lid of the making of a Yorkshire movie classic. Author Simon W. Golding has written a very influential book that is quite hard hitting surrounding Mr Loach’s Yorkshire movie Kes. Life After Kes is a true anthology of the Barnsley classic movie Kes. Life After Kes delves into a Barnsley that following Loach’s classic Kes, was left with an overwhelming inheritance of stereotypical Northern doom. This is a very important book - both socially and politically. Life After Kes is true to Barry Hines original novel, A Kestrel For A Knave and Loach’s gritty Northern classic Kes. Life After Kes certainly has plenty of humour, but there are also some disturbing bits in it – like the canning scene – the morals of fame at such a young age. There was a legacy and a price to pay and the book certainly does not shy away from these areas. Simon Golding has written an extraordinary book called Life After Kes that delves deep inside the making of Kenneth Loach’s award winning film; Kes.